Has anyone else noticed that it’s almost October? The last time I looked, it was July. What happened there? I guess moving house took up a significant portion of that time around here. I’ve also spent a lot of time thinking, I really should sort out my sewing room and study so I can actually use them, which is time that would have been better spent actually sorting out my sewing room and study, because at present, the only one using said rooms is my cat, Pickle, who has decided my desk chair is better suited to her afternoon sleeping requirements than any sitting I might be thinking of doing on it. But today I’ve been reading blog posts from people who are sorting out their sewing spaces or trying to get into good routines and it’s made me think I should combine the two and see what happens. The good news is that I’ve made a little progress since my last post. My socks are now a proper pair and I have blocked the front and back of my jumper so I can make a start on doing the neckband that is unfortunately necessary to the garment (my loathing of picking up stitches for neckbands is the main reason I prefer boatneck jumpers). 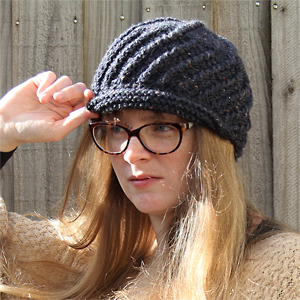 I’ve even found the pattern that will enable me to complete my current Delightful Dozen project. I have also completed Stage One of the sewing room project and have begun Stage Two, which purely involved working out where my desk should go. Perhaps, like me, you would think this was a relatively straightforward process. I thought I’d found the perfect spot until we had a warm day and I discovered my desk would be located in the hottest spot in the house. While this would be marvellous should I need a place to soften up some butter in a hurry, it’s less great for working on a laptop in comfort and ease. This new-found knowledge required me to spend forty-five minutes lowering the stupid venetian blinds (I wish I was joking about this but there is not a word of a lie in that statement: forty-five minutes. I need to write to someone about this so I can have that almost-hour of my life back). I think I have the right spot now (along with an abiding hatred of metal venetian blinds), which means Stage Three can begin. This enthralling stage involves positioning my music stuff and then placing all shelves and modes of storage in the remaining space. Stage Four will involve a good sit down and probably a cuppa. What am I saying? Definitely a cuppa. Come to think of it, perhaps it would be best if all stages with an even number involved a good sit down with a cup of tea. This is what Stages One and Two have looked like thus far. You may notice quite a few photos of birds in there that are completely un-related to setting up my creative space and this is because they will insist on visiting our deck and looking cute. Most mornings look a little like this through our front window. Pickle explores my study before some sort of order descends upon the chaos. Almost lost the mountains for a moment there. It looks like my chair’s in the right spot, at least. For Pickle. Mr & Mrs King Parrot. The day before, we were visited by Mr & Mrs & Mrs & Mrs & Mrs & Mrs & Mrs & Mrs King Parrot. It seems he thought that many wives was too many. The cats assess the prospects of this particular desk placement. Of course, everything I do must be approved by our feline overlords. Given that Pickle has spent half her days asleep in my desk chair, I’m assuming this means it’s in the right spot. For her, anyway. I haven’t had a chance to test it myself yet. How many stages are left in this project? Hopefully not too many, because I’m planning to reward myself with the purchase of a new theme for my blog when the job is done. Mostly, though, I just hope the space will be relatively complete before I turn around and discover it’s 2024. I am *so very* jealous of your location, your mountain and the visiting king parrots. I also think a cuppa is required at all stages. At stage one (staring into space and thinking, aka ‘planning’, which might also be intermittent stages between all other stages), cuppas are absolutely essential. It is taking me / will take me weeks to reshuffle the sewing space, but it is getting there. The great thing about getting the organisation sorted is realising that I’ve got a bit more fabric stash space! La la la off to the fabric shops! And FYI, in my sewing room, I moved the table about 5 times before finding a configuration I liked! I moved it, then worked there for a while thinking it wasn’t too bad, then tidied and rearranged the space because we had guests, then after the guests, decided there was a different place I could put my sewing tables … and then the process kept repeating. So I don’t think it is necessary, if you have space to play with, to set up your room in an immovable fashion. Especially as, in winter, you might rather like that warm spot. Good luck 🙂 I look forward to seeing the process and/or the end result! It may take us ages to get anywhere, but it’s lovely to know we’ll be coming home to mountains and birds. I highly recommend it. I like the idea of my space being a little fluid when it comes to configuration. My desk seems to be in a good spot for now but you’re right – I may feel like shifting to that extra warm corner next Winter! It’s also right next to the central heating vent for that room, so it’s a win on many levels. It’s all going rather slowly but I’m hoping I’ll have something to show by the end of next week. Otherwise, I can see myself shoving everything off the sewing table in a mad rage so I can just set the sewing machine up in the middle of the clutter and SEW SOMETHING. I need pretty new dresses for the warm weather that will eventually get here, I assume. Beautiful views out the windows. Don’t your cats go bonkers when they see the birds? I am sure setting up your sewing room slowly will just ensure it is fabulous! Oh yes, the cats spend a lot of time at the windows, just watching. And waiting. It’s their favourite channel on Cat TV. Hopefully it will be fabulous once it’s done! At the moment, it’s just driving me crazy that I can’t do any sewing and I really feel like I need a new dress or two. Birds and cats and views and a room or two of one’s own? Bliss! It will be great when it’s done. Having just completed this process, I feel that what helped me most was a vision of what I wanted out of the room. Here is a quote from my blog when I started: “I want a space with both a sewing and a knitting area, where all machines are easy to get to, that is easy to clean. I want easy access to both fabric and yarn. I want to display my dolls. I want my children to be able to come into the room without me hyperventilating because they will touch too many hot, sharp, and delicate things.” Keeping this in mind helped me a lot. For example, I did not give in to the temptation to put the machines on the empty, high shelves, where surely they would have fallen down and killed me. Thanks for that advice – I should definitely have a guiding theme in mind when I’m working everything out. At the moment, my aim is just to get things out of boxes, particularly my sewing machine, as it’s rather difficult to sew otherwise. I have a feeling there’ll be a fair bit of stuff that can go to new homes, too. Plenty to think about! I’m rather fond of our view. 😀 It’s just as well I can’t really see it from my two rooms or I’d never get any work done. That’s a great approach to take. Cleansing the stash is a hard one. The year has gone SO fast. I’m totally horrified that it’s already October. How did that happen??? Looking forward to the next update…after living in this place for over 3 years, I’ve rearranged my sewing stuff more times that I care to count. Fewer this year, but that’s probably because the worst of the renovating is done. Everyone has such unique ideas for storing and organising their stashes. This whole October business is highly disturbing. I probably ask this every year, but what happened? Something happens around August that seems to put everything into fast forward until we hit Christmas. I have a modest update coming along soon, although it may be a bit of a Spot The Change puzzle. If you look hard, I’m sure you’ll see I’ve done something. The more stuff I move around, the more I understand what I actually need.